De Soto Car Wiring Diagrams above the page. Companies "De Soto" at the time of liquidation of 30 November 1960 issued 2,024,629 cars. In America, there was no more demand for mid-size cars. In 1955, the share of sales of these cars was 39% of the market, in 1957 - 31% and in 1958 - 26%. The average American to buy a big American car, or less imported. The compact model yet no one was interested. In 1957, the company "De Soto" has sold 117,747 copies, and the next year - only 36 556. In 1961, sales fell to 2,400 vehicles. As a result, it is gone another brand. Company "De Soto" founded 4 August 1928 Pёrsi Walter Chrysler, calling it the name of Spanish researchers, who once was the governor of Cuba. Mark "De Soto" was intended to compete with the brands "Oldsmobile", "Nash" and "Pontiac" (PDF Manuals pages). The first year it managed quite successfully. "De Soto" The company used to their cars the same body as that of "Plymouth", "Dodge" and "Chrysler" (Manuals PDF pages), but the cars were much cheaper. The last pre-war car was made February 9, 1942, and the first post-war - in March 1946. In spite of the new doors, fenders and bumpers, he looked exactly the same as the 1942 model. The first post-war models were Deluxe and Custom. Room had a six-cylinder engine working volume of 3580 cm and a capacity of 96 liters. s, and Kast model engine - 3880 cm3 and 110 liters. from. Different cars and the size: Deluxe has a wheelbase of 2970 mm, and Custom - either 3080 mm or 3540 mm. Produced and cars with coupe and convertible, but bad buy. The first genuinely new cars were shoved into production in 1949. They looked compact but provides more space by increasing the wheelbase to 4100 mm. In June 1949, eight-car station wagon was made. Before the war, the company "De Soto" is made as an inline six- and eight-cylinder engines. V8 engine first appeared in 1952. This power unit was modern Fayrdom verhneklapaniym engine that had similarities with V8 engine Fayrpauar company "Chrysler". The engine had a working volume of 4.5 liters and a compression ratio of 7: 1, and two-chamber carburetor hemispherical combustion chamber. Power is at least 162 liters. from. at 4400 rev / min. Fayrdom engine was one of the most powerful and modern for the time. The Company's competitors, such as "Buick" (PDF Manuals), "Pontiac" and "Packard", were available only in-line pre-war eight-cylinder engines. Unfortunately, the company "De Soto" was unable to take advantage of it. The V8 engine was slightly above the eight-cylinder engine with in-line arrangement of cylinders, and so in order not to create an entirely new body, the designers have designed air duct in the hood. This air passage were not provided with a model with only V8 engine, and model-six power unit, resulting in vehicles with V8 engine lost its exclusivity. In 1953, all models of the company "De Soto" got new names. Cars with six-cylinder engine were called Povermaster Six, and with the engine V8 - Fayrdom. Aft model with six-cylinder power unit has disappeared from the market only in 1954. The company has tried to promote a new model of Coronado. Meanwhile, sales dropped dramatically to 69,844 vehicles. All management team, "De Soto" was filmed, and the new leadership of 250 mln. Dollars for the return of the brand lost positions have been allocated. The designer Virgil Exner proposed several impressive projects. His creations were Fayrdom model with a V8 engine displacement of 4768 cm and a capacity of 187 liters. from. and Fayrflayt with a motor of the same volume capacity of 203 liters. to which it has been put into production November 17, 1954. Cars have the same wheelbase of 3,200 mm, and were spectacularly painted in two colors. Buyers flooded into the salons, and the company "De Soto" in 1955, has sold 129,767 copies. Exner was on top of the world, and the director gave him greater freedom of action. Soon he developed his first four-door car with a body hardtop. The company "De Soto" did not stand on the sidelines in the competition for high power: in order to compete with the Chrysler 300 model, Virgil Exner in 1956 created a model Advenchurer. This new car with coupe is available in black, white or red, or any combination of these three colors. Its V8 engine developed capacity of not less than 320 liters. with, driving the car to 230 km / h. Car Advenchurer was the most powerful, produced in Detroit in 1957. 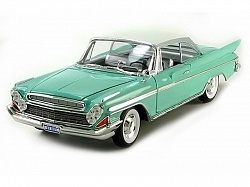 Models of "De Soto" every year improved and became more elegant. They bought two pairs of headlamps and rear stabilizers on the wings, but these improvements have not prevented the decline of the brand. In 1959 the volume of production in our own factory of "De Soto" was so small that cars had to assemble the production line, "Chrysler" plant. Latest De Soto car with a convertible body left the production line in 1959. In 1960 he produced two models: Fayrflat and Advenchurer, both running on the basis of "Windsor". It sold only 1941 car, so the November 30, 1960 the company "Chrysler" has decided to discontinue production of the models of the brand "De Soto".